One of the most popular multiplayer action game "Doodle Army 2: Mini Militia also known as DA2" is now getting a major update with tons of Avatar selections, two new Store items and bug fixes. The latest update v3.0.136 features new Store items including "Pistol scope" which increases zoom on pistols by a factor of 1X, "Range Finder" which reflects distance from the enemy. You also get new vibrant festival/club color choice dress combinations in the Avatar customization tab. Along with these features, Appsomniacs has also added Score Sync config tool to aid support with migrating scores to the new score storage system and Numerous bug fixes. Note that the old versions won't see the visual changes. 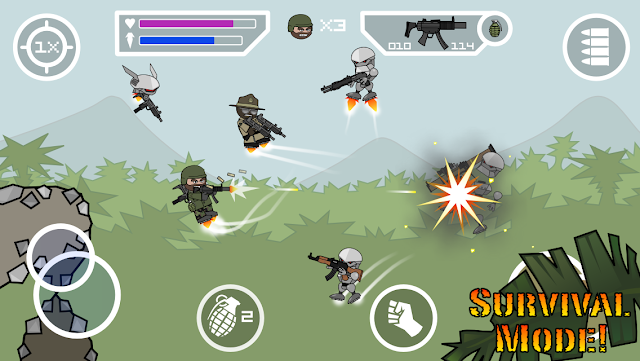 You can download Doodle Army 2: Mini Militia for free from the Google Play Store. But if you want to get full access to all the features, you can upgrade to the Pro Player Pack through in-app purchases.